An adventurous way to explore the historic waterway! 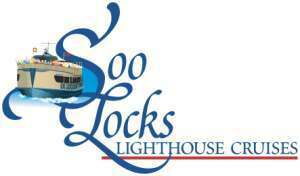 The Lighthouse Cruise is an approximately 4-1/2 hour trip that departs at 8:00 a.m. from Dock #2. The tour begins by going up through the American Locks with our lock tour narration. You will see the lightkeeper's residence at Birch Point, and what remains of the original lighthouse on Round Island. From there you will head toward Bay Mills Point along the shoreline leading up to the Iroquois Point Lighthouse, where you will get a sailor's view of the lighthouse built in 1871. As your vessel heads toward the Gros Cap Light, you will view Whitefish Bay, the entrance to the largest fresh water lake in the world - Lake Superior. At this point in your tour, you will cruise into Canadian waters getting a close-up, panoramic view of the Gros Cap Reef Lighthouse which is only accessible by boat. Another Canadian point of interest is the beginning of the Laurentian Mountains, the oldest mountain range in North America. The tour is fully narrated. Our narrator will explain each highlighted point, local history, and navigational aids. Weather concerns may dictate which points of interest can be visited. In the event of inclement weather, other points of interest or an alternate Lighthouse Cruise may be substituted. The on-board breakfast buffet includes: Scrambled eggs, bacon, sausage, sausage gravy, American fries, biscuits, fresh fruit, cinnamon rolls, and apple strudel. Beverages available include juice, milk, and coffee. Box lunches are also available with advance notice. The lower deck of the boat is enclosed and heated for your comfort, with rest rooms and a snack bar available. Call 906-632-2512 for reservations. Reservations are recommended. All departures from DOCK #2 at 8:00 a.m. Call us at 906-632-2512 for possible departures. Please see calendars for most current lighthouse cruise availability.